Safety Orange Websites loves to network! If we meet you and like you, we will promote you on our website. Here are our networking groups and some of the wonderful businesses and people that we have met in our networking circles. Safety Orange says: North County Professional Networking is a group of professionals, who build business through our amazing networking relationships. Members pass qualified referrals to fellow members knowing that the professional they are referring is well qualified and well respected within their business community. This group has a business to business focus, but is open to business to consumer professionals. This group meets weekly so that business can be done on a regular basis and so referrals passed and revenue generated can be closely tracked. No, we are not stat focused and fanatical. In fact, we are quite the opposite. We have loads of fun at each meeting and have mostly all become good friends, if not a big happy family. We love it! We are category exclusive. Ewach of Check out our website for more details. FYI - we made their website. Safety Orange says: Peter, Janet and Belinda are extra special people. They are always professional and friendly. We do business with them and personally know other companies that use their services. Their products and services are top of the line. Their prices are fabulous. Hugs to you all! We can help your Office Grow, Run Smoother & Save Money!With over 25 years of experience in the Printing Industry, Dragon Printing can help you. 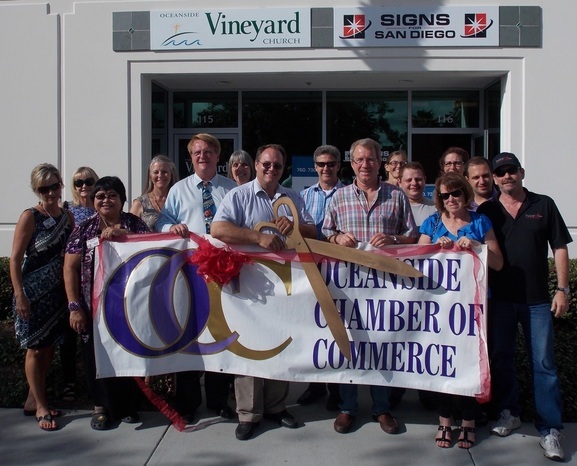 Safety Orange Websites have been members of the Oceanside Chamber since May 2013. OCC is very focused on helping it's members. They have been instrumental in our expansion and growth since the day we joined them. Doing Business With Those We Know, Like & Trust! Business Networking can be both Enjoyable & Productive. Really!! Frank Murch is such a great guy. We have known him since day-one we moved to Oceanside. He creates great products and has great service. Minute Digital Media - Mike the aMazing! Internet videos are fast growing as a marketing tool for businesses to expand. Get a professional! Mike Ellis is not only a professional, but he is a very sweet, nice and fun guy. You will like him a lot! We can help your company improve image and market share, through HIGH IMPACT MARKETING VIDEOS! Minute Digital Media provides powerful marketing solutions, as well as, effective training, orientation, event and instructional videos. We can assist any company with meaningful and cost effective solutions. We also have a specialization in senior communities, where virtual tours, events and unique capabilities are highlighted for families! DMZ Visual - David is so friendly! Safety Orange says: Yes, while we may be in "competition" for the SEO and Social Media, this photography is something you will want to add to your web marketing. We love David! He is patient and compassionate and we enjoy his company. David is such a friendly guy. He reminds me of my friends in Hawaii! If you are looking for growing your business online presence to increase sales, DMZ Visual can help you. Combining photography and marketing with social media, SEO, and mobile marketing, this is a complete business marketing solution. Visit our Photography page for links to view photo galleries from special events and portrait sessions. We are here to serve you and answer any questions you may have.